Today, oil prices are falling amid growing reserves of "black gold" in the United States. According to the Ministry of Energy, US commercial energy reserves rose by 2.8 million barrels in a week, which surprised investors, as analysts forecasted a decline by 2.2 million barrels. In general, the situation in the oil market can be described as moderately negative. OPEC + efforts to cut production, as well as US sanctions against Iran and Venezuela, prevent the instrument from falling. However, the uncertainty caused by fears of a global recession has a negative effect on demand. Tomorrow at 19:00 (GMT+2), Baker Hughes will publish statistics on active rigs in the United States. Reducing the production volumes will allow the instrument to strengthen above the psychological level of 68.00. On the 4-hour chart, a downward trend is being corrected. The instrument has reversed upwards from the key support 68.00. Bollinger bands are directed sideways, and the price range has decreased, indicating a change in the current trend. The MACD histogram is in the positive zone, forming a poor buy signal. 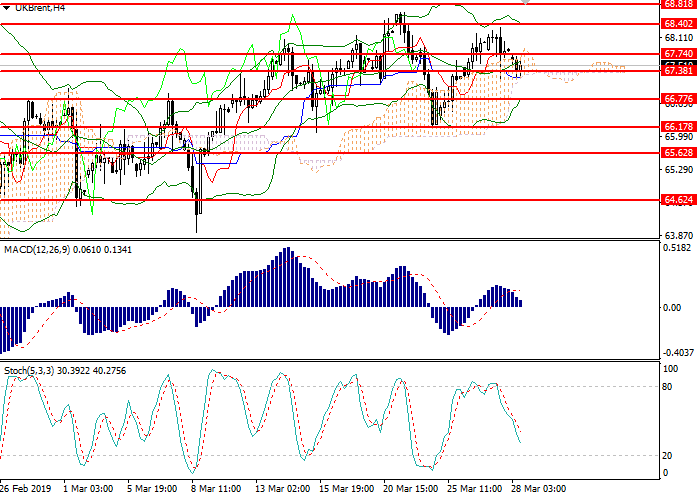 Stochastic is preparing to enter the oversold area, a strong buy signal can be formed before the end of this week. Resistance levels: 67.74, 68.40, 68.80. Support levels: 67.38, 66.77, 66.17, 65.62, 64.62. Long positions can be opened from the current level with the target at 68.15 and stop loss 67.10. Implementation period: 1–2 days. Short positions can be opened below the level of 67.15 with the target at 66.35 and stop loss 67.60. Implementation period: 1–3 days.